Madeline Gannon is a doctoral student at the CMU School of Architecture, Pittsburgh, working in generative fabrication and computational design. Over on her website Madlab, you’ll find news of her fascinating experiments and investigations into ‘the conceptual and technical process of making.’ As one would expect, Gannon is very interested in 3D printing and this week she revealed a compelling project called Reverberating Across the Divide, which uses 3D scan and print methods to craft digital forms across physical bodies in a chronomorphologic environment. Using open sourced software such as Processing and Toxiclibs, she created an environment in which the movements of objects can be tracked and used to make elaborate geometries. Those shapes can then be printed, as jewellery, art pieces or sculptures. The below video gives a fascinating insight into the process. Here, Gannon pulls a squid-like shape through the environment using Kinect. As the squid moves, traces remain, forming new designs on a human-like object’s neck. The chronomorphologic modeling environment facilitates rapid generation of baroque and expressive spatial forms that both respond and expand on existing physical contexts. By mediating 3D scanning and 3D printing through the modeling environment, the designer has a streamlined workflow for oscillating between virtual and analog environments. Anouk Wipprecht is fast becoming our favourite fashion designer – you might remember her hypnotically beautiful, 3D printed smoke dress that was unveiled at the International Motor Show in Frankfurt last October. Now, the Dutch trendsetter has unveiled her latest line of astonishing attire, with a show-stopping display during the New Year’s Eve celebrations at Las Vegas nightclub LIGHT. Housed in the Mandalay Bay Resort and Casino, LIGHT is a wild and riotous nightspot where death-defy entertainers from Cirque De Soliel perform, sound-tracked by world famous DJs spinning in the booth. That makes it the perfect home for Wipprecht’s ground-breaking garments. Like the smoke dress, the latest 3D print designs from Wipprecht have been created in collaboration with Italian architect Niccolo Casa and 3D print company Materialise. 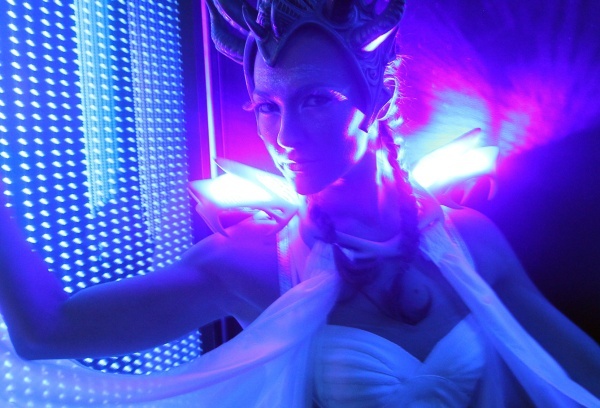 Printed using a Laser Metal Sintering technique, the additive manufactured items include four independently controlled shoulder pieces with an illuminating strobe effect, powered by 20 Watt LEDs that shine and flicker through the outfit. Wipprecht shows herself, once again, to be the most far-out fashionista on the scene, positioned right on the cutting edge of style, engineering, science and technology. From artificial eyes to plastic duck feet to robotic hands, we’ve already seen plenty of stories about how useful 3D printing is for producing prosthetic body parts. Yet few have been quite as profound or inspiring as that of Project Daniel from Californian media and technology company Not Impossible. 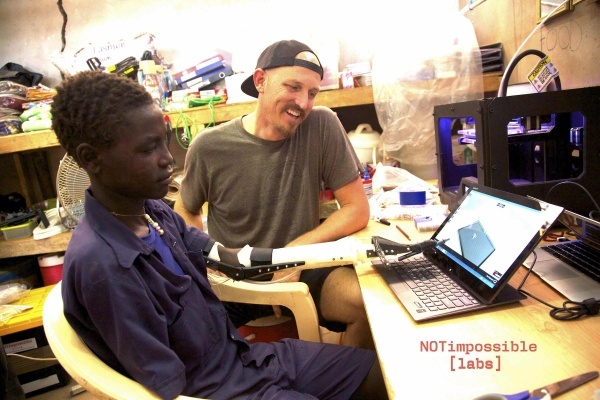 Last November, Not Impossible founder Mick Ebeling visited South Sudan and the war ravaged Nuba Mountains to set up a 3D printing lab specifically for the creation of prosthetic limbs. The main aim was to train the locals in how to use the technology themselves, giving them a means to aid the scores of people in the region who have lost parts of their body to armed conflict. One of the first beneficiaries of Not Impossible’s mission has been a young boy named Daniel. Two years ago, at the age of 14, a bomb blast took both of Daniel’s arms. Since then, living in a refugee camp in Yida, he has greeted each new day with despondency, with little hope for his future or the futures of those around him. In order to prove that new technologies can and will improve life for the world’s least fortunate, Not Impossible made Daniel the focal point of its campaign. 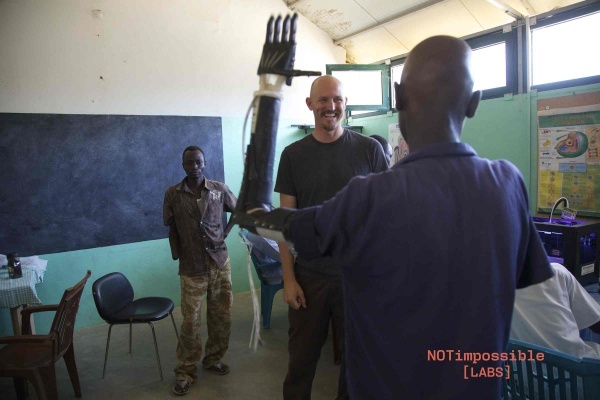 Bringing together a ‘dream team’ of innovative minds from across the globe, including the South African designer behind Robohand, it set about manufacturing a left arm that would give Daniel back some of his independence, functionality and hope. As you can see from the video below, Daniel can now feed himself, pick things up and get through his day with far greater comfort than anybody thought would ever be possible this time last year. 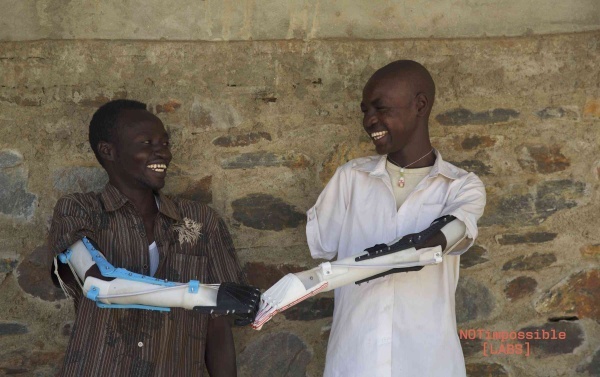 Yet, even more importantly, the work has continued since Daniel got his left arm back, with a prosthetic limb printed each week since November in the lab, despite a ferocious escalation in violence in the region. The designs for Project Daniel have been released, open source, online, in the hope more firms across the world will be inspired to take the lead from Not Impossible and implement similar project in other regions that have been fractured by combat.